Bonnie Tyler went backstage at the Porthcawl gig in South Wales in August 1978 - the famous gig where Nod was beaten up by a bouncer. Bonnie was very nervous meeting the band - she had been a big fan when she was a kid. Jim was amazed because she asked for the band's autographs. You very rarely saw celebs getting Slade's autographs. The Boomtown Rats stars were at the Music Machine gig in 1980 and came backstage afterwards. Johnny Fingers was even wearing his trademark pyjamas - with a leather jacket on top! With the Boomtown boys was Geldof's girlfriend, Paula Yates. Despite being the author of a weekly Record Mirror gossip column "The Natural Blonde Column" she was very quiet - in actual fact I think that she didn't say a word. Geldof however raved about Slade's performance - he asked Nod how could Slade go through with playing small venues, when they had previously been so famous? Nod explained that it happened to all big groups - everyone went through a fall. ithin a couple of years the same fate happened to the Rats....They went from playing big venues, to half filling the small clubs. Nod wrote about the experience of meeting Geldof, and the conversation they had, in the lyrics of "Do You Believe In Miracles". British motor racing champion came backstage at The Rainbow gig in '77. He was cool and casually dressed. Said he'd always been a Slade fan. Roy came backstage at Slade's Marquee, Wardour Street gig - on 23 June 1980. He was one of the nicest pop stars I'd ever met. He was very un-assuming but very friendly. He worked his way round the dressing room, introducing himself to everyone, the Road Crew, Families etc. He came to me, a young 20 yr old. I told him that I was a fan who run Slade's Fan Club. He was interested, asked all about it and sat with me and chatted for about 20 minutes. What a guy! I didn't meet Rick at a Slade gig - but I met him when I was out with Don at a Jets gig at the Dominion Theatre in Tottenham Court Road. 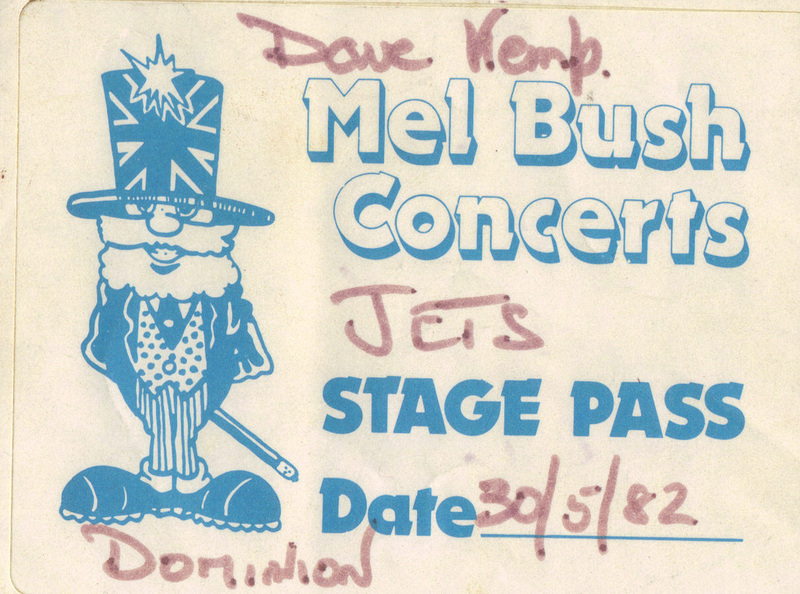 Don had been given free passes from Haden Donovan (Slade roadie who was working as Road Manager for The Jets) - and I went with him to enjoy the free show. Rick bowled over to Don - they were good friends from the "old days". Rick was full of himself - and said that we shouldn't let the evening end after the gig. He took us both for supper at "Witchitys" in Kensington - a flash late night restaurant. Rick obviously liked Don and had great respect for Nod. He talked about when Quo supported Slade on their first Australian Tour (early 1973). He recalled how amazed he was at the sight as they arrived at Sydney airport - thousands of kids everywhere waiting for Slade. 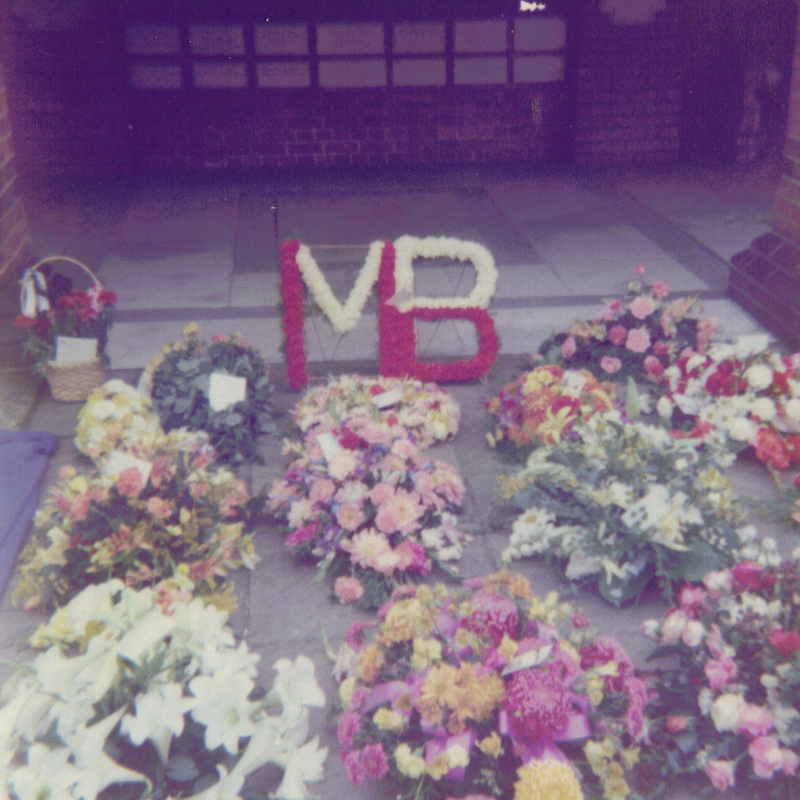 Slade had just received six Gold Discs for Slade Alive and they were bigger than the Beatles. In 1982 Rick was heavily into drink and drugs. He was openly sorting himself out in the street as I used a cashpoint in Tottenham Court Road, before we jumped in a cab. As the evening wore on - it became apparent that he was however that he didn't hold Jim Lea with such high regard. He called him aloof and arrogant. Don shrugged the comments off - but Rick continued to slight Jim. He made comments such as "look whose more popular now? " Anyway, shortly after calling to say that he wouldn't be home, Patti Boyd turned up at the restaurant. (Patti was the girlfriend of Rod Stewart - and she ended up being Rick's second wife when he divorced......). But what the heck - it was a good evening and Rick picked up the bill! However, it became apparent that Jim obviously didn't have a problem with Rick - as he guested on bass when Quo performed "Margarita Time" on Top of the Pops a year later. Maybe Rick's problem was all down to his over-indulgence (and we've all been there before). Bruce Dickinson and Brian May both turned up at one of Slade's Hammersmith Odeon gigs in 1982. Bruce Dickinson was scruffy, and really dressed down - I had to do a double-take as I didn't believe it was him. Dickinson was just interested in drinking the free beer backstage.... Brian May was nice. He wore his famous clogs and talked to all the band. Slade had been big mates with Queen - and Brian spent his time in the dressing room updating Slade with what Queen were up to. Suzi went to several Slade gigs. The one that I remember seeing her at was the University of East Anglia gig in Norwich in 1979. She turned up unexpectedly with her husband at the time, Len Tuckey. 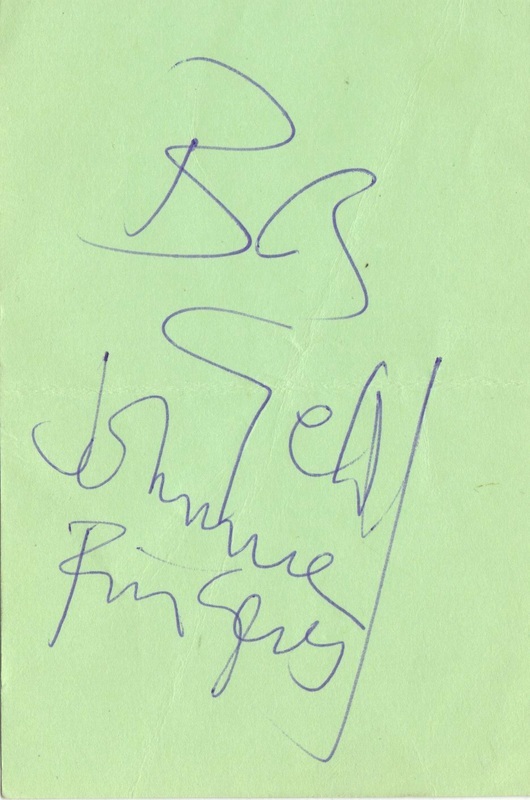 The late Michael Jackson and his brothers turned up at a Slade gig at Leicester Baileys in February 1979. Slade were doing a week residency and I was staying in a local guest house with Sue O'Leary, Alison Hillmen and Kevin Massey for the gigs. I think the Jackson brothers turned up for the Thursday night gig - when there were only about 50 punters in! (The Jacksons boosted the numbers). The Jacksons had brought their "Destiny Tour" the UK at the time, promoting "Blame It On The Boogie". From what I recall, they had played Manchester Apollo (I think) earlier in the evening. They called in to the Slade gig after their own - as Slade weren't onstage til about midnight. (Leicester wasn't too far a drive from Manchester). All of the Jacksons, including Michael, went backstage at the end of Slade's set. The Radio One DJ went to several of Slade's London shows in the early 80's. I got to know him by dropping him copies of the Fan Club magazine when he used to run his nightime radio show. He used to read out excerts ad comment on some of the photos. It was good to eventually meet him in person. When Mike moved to becoming the breakfast show host (in 1981), he was the first Radio One DJ to preview the "We'll Bring The House Down" single. He played it for the first time on my 21st birthday - 14th January - and dedicated it to me! I didn't hear the namecheck - as I was travelling to work. When I arrived many of my colleagues told me all about it! A few weeks later he rang me live on air to take part in a "Beat the DJ" competition. He tried to stump me with questions about Slade. And he did. Nerves got the better of me - and the one question I couldn't answer was about the writer of "Get Down And Get With It"! 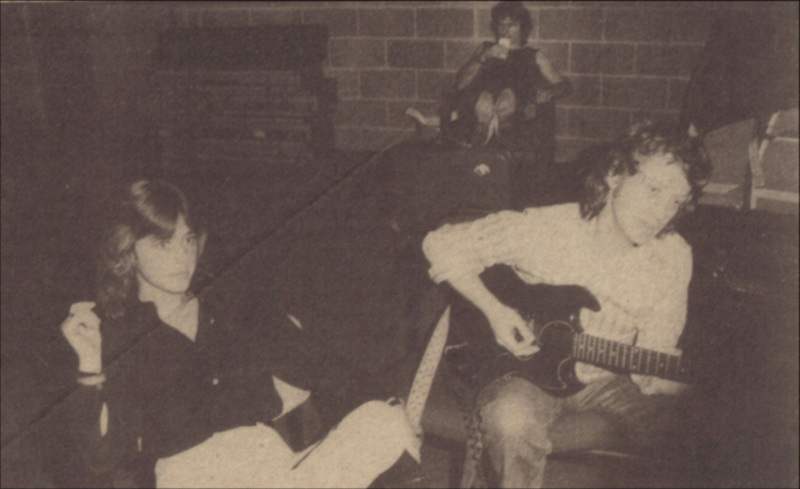 Steve became good friends particularly with Don in the 1980's. He went to lots of the gigs with his girlfriend Julia - who became close to Don and his girlfriend Carol at the time. Steve's band were hyped by the music press as being the "new Beatles" - playing Power Pop. They almost had a hit with "The Kids Are Alright". Steve came from a fairly wealthy family from Wembley. The family always invited Don to family Bar-B-Qs etc. I'm afraid that I didn't really like Steve. It seemed a bit of a hanger on. Nigel was drummer with Lt. Pigeon - the band who had a No.1 with "Mouldy Old Dough" in 1972. You must remember them - they had a smiling granny called Hilda playing the piano on the Top of the Pops performances. The band came from Coventry - and I met Nigel at the Coventry City Centre Club gig in 1979. He was good mates with Don - as they had drumming in common. He kept in touch for many years - and went to loads of other gigs. However, I must mention Jim Davidson, the comedian. When Slade played the Coventry City Centre Club (24 May 1979) he was performing there in panto during the week - and I think he had a night off on the Thursday (?) when Slade were performing. He asked if he could introduce the band onstage. They agreed. However, once he got on stage to "build the band up" they couldn't get him off! He went, on and on, and on. Until the chants of "We want Slade!" from the crowd overpowered him! 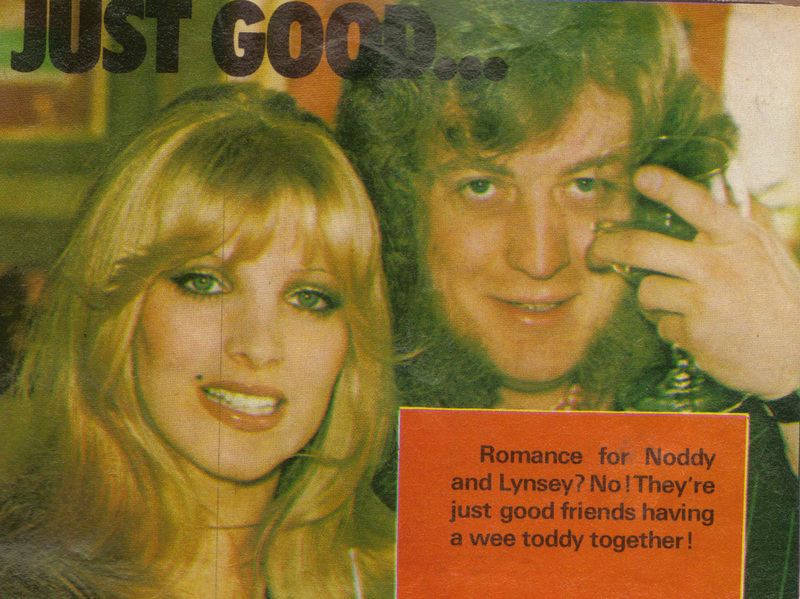 For a period of time in 1974/1975 Lynsey De Paul was dating Slade manager Chas Chandler. I only ever saw her once at a Slade gig - the Saturday gig at the New Victoria Theatre, 26 April 1975. I was hanging around for the band after the gig, chatting to the roadies. I saw Lynsey leaving the venue, with Chas, holding his son Steffan's hand. Steffan was dressed up a mini Noddy - wearing a mirrored top hat! I never met him at a Slade gig but Slade used to recount stories of him. They knew him from when they had played in Germany - years before. They liked him a lot - and they got on well. Don told me that on one Top Of The Pops he ordered champagne to be delivered to the Slade dressing room - to celebrate them getting to No.1. They lived near me in West Hampstead and they had a Top Ten hit with "I Am The Beat" in 1981. The band did the rounds of tv shows at the same time as Slade were promoting "We'll Bring The House Down". The Look came to know Don in particular (through mutual friend Riff Regan of punk band London) and came to the Hammersmith Odeon gigs in the early 80's. Annie used to be a champion of Slade's cause on Radio One. Nod once told me a story about her at the Montreaux Music Festival in the early 1980's. She had got so drunk at the festival that she missed the coach taking all the Radio One DJs back to their hotel. She decided to sleep on a sunbed on the beach - and wait for morning to come. When she woke from her drunken slumber she found that she'd been mugged. Her handbag with credit cards etc had been stolen. I met Annie about a year after this at a Bolan event in Oxford Street in the West End. She was very drunk (again) and so was I. I thought it would be a good idea to recite the story to her........she wasn't impressed! The boys met Spandau when they both performed at the Montreaux Music Festival in 1983. Spandau stayed up late drinking with the lads. They told Slade what big fans they had been. Don told me that he was very impressed with Spandau's drinking powers! Don once told me that the he had met their RCA "stable" mates - Bucks Fizz - when he and Dave Hill and the Fizz were all together on a train journey. The train was packed to the rafters - so they all sat in the mail car. To pass time during the journey, they all played "Give Us A Clue". Slade always had the utmost respect for old stars - especially ones who were idols of their parents. The band managed to meet Dame Vera Lynn in 1973 at the Melody Maker Awards presentation at The Savoy Hotel, in The Strand, London on 1st March 1973. I went with Don to see the Nolans perform at Watford Baileys. I can't remember Don's connection with the band - but I think he knew one of their sound guys, who got us tickets. We went backstage to meet the girls after the show. They were as sweet as pie - later Don told me that one of the girls (who shall remain nameless) had recorded some saucy material with her boyfriend on her camcorder in the dressing room. And to think that I believed that butter wouldn't melt in their mouths! Don asked me if I fancied going to see the Eric Bell Band - at the famous Bridgehouse Pub in Canning Town in 1980. (Eric was friends with Don from his Thin Lizzy days - when they supported Slade on their 1972 UK Tour). Canning Town was a pig to get to from West Hampstead - so I drove. It was a good gig - and Eric was a nice guy. We had a pint with him after the show. I remember seeing Chris Foreman at all Slade's Music Machine gigs. It was no great shakes - as the band came from Camden Town the MM was their local club. However the Madness boys respected Slade - they used Dave Hill's Super Yob guitar in one of their videos. In the early 1980's Ozzy and Sharon Osbourne used to live in Hampstead (Heath Drive) - just over the other side of the Finchley Road to Spirals (Slade's favourite London wine bar). I was once out with Don and we bumped into Ozzy and Sharon in the bar. As we had a drink, Ozzy told us a story of his teenage years growing up in the Midlands. He said that he came from a large family (he had 5 brothers and sisters) - and his Mum always had to do catering style cooking. Also, Nod would often meet Ozzy in Spirals. A story goes how once Ozzy went to meet Nod there for a quick drink in the afternoon. He was due home by 5pm. However, hours later, when Ozzy eventually decided to go home, he begged Nod to go with him - as Sharon would kill him......She almost did - she greeted Ozzy and Nod at the front door with a gun - that she left off - with the bullet hitting a car. I spoke to Sharon on several times when I ran the Fan Club. She took over managing Slade in the States for a short time. She booked the band to support Ozzy on their fated last ever concert tour in the US. Wayne, Merrill and Alan Osmond attended one of Slade's two Rainbow shows in London on either 10th or 11th November 1972. Donny didn't attend (he was too young - it was past his bedtime - although they said he was ill). This bizarre trio turned up at Slade's Music Machine gig in Camden on 13 December 1979. In actual fact, in music terms, I could easily have gone down another route than following Slade - I liked the music of Marc too. Alongside Slade I bought all the T. Rex singles from "Get It On" right up to "Celebrate Summer" when Marc died in 1977. I met Marc twice; at Top Of The Pops in 1974 when I was in the audience when he performed "Teenage Dream" and outside Capital Radio in 1976 (when he was appearing on Maggie Norden's "Hullabaloo" - with Rolf Harris. Rolf let me play his didgeridoo on his way in!). I saw him live in concert only once, at the Lyceum in London, also in 1976. Slade battled Bolan between 71-73 for chart supremacy - and Slade won. Slade fans were a totally different breed to Bolan fans. Slade's crowd was mainly male (boozy, working class - including me) and the few girls that liked Slade were of the type, as my Dad used to say, "Never shy at coming forward". 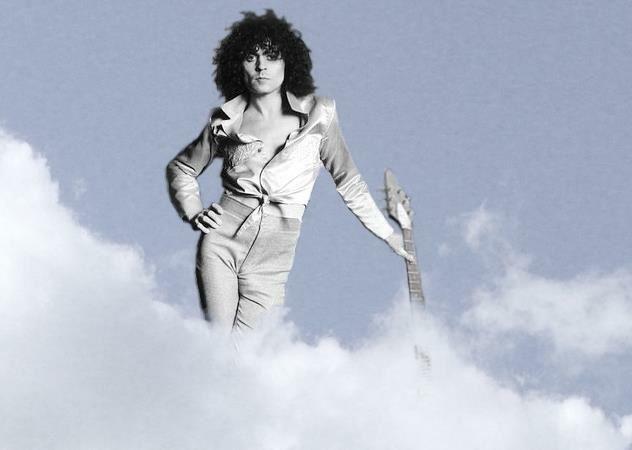 Bolan's fans were mainly female, dreamy girls, with flowing locks and hippy smocks. The few guys that used to follow Marc were often intellectual, arty types, into the inner meanings of the lyrics and Marc's style and image. However, I decided to follow Slade, but I really liked Marc and religiously watched his final tv shows in the "Marc" series). I don't know whether Bolan and Slade got on. I would have imagined that Marc would have resented Slade's success and Dave Hill latching on to the "glitter tear" he put on his cheeks - and taking it a step further (glitter on the forehead and hair). I know that Marc once listed his Top Ten favourite people in the music mag Disc and included Nod. However, I was never aware of them "hanging out" together (maybe because Marc was very much based in London, were as Slade at their height resided in the Midlands). I was shocked by his car crash death in September '77. 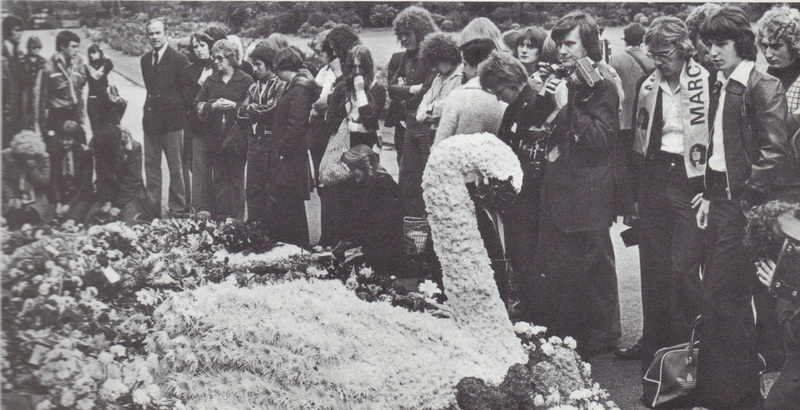 His funeral took place in Golder's Green - five minutes on the bus from where I lived. I bunked off sport at school and went in the afternoon. I thought that Slade might attend (David Bowie and Rod Stewart did) - but Chas's secretary said they had other commitments that they couldn't get out of. They sent a bouquet of white lillies though. I often spoke to Jim about Marc's music. I was blunt with Jim - I thought Bolan's material was really well produced by Tony Visconti (and has stood the test of time). Chas's production of Slade was too flat. Chas always just turned up the bass and drums. I think that Jim himself had better results at production when he took control years later. On 27 October 1978 Slade were playing a gig at Guildford University. I was backstage with Jim before the gig discussing Marc. He was interested in a fan's biography book ("Marc Bolan - A Tribute") that I had with me - I gave it to him. Marc Bolan RIP. "Our lives are merely trees of possibilities".